Welcome to af1king.com where the Nike Air Force One reigns supreme! While this website does carry loads of other exclusive sneakers, shirts, and custom kicks (hand painted or reconstructed authentic sneakers), my love for the Nike AF1 is the main reason I built this website. My nickname is “Chef” and my sneaker enterprise / brand is called GourmetKickz. I began collecting kicks over 10 years ago and have been customizing them for about the same period of time. I am both a sneakerhead and an artist. Therefore there are two distinct product groups on this website: exclusive sneaker releases for resale, and custom kicks that have been modified by me. I also sell t-shirts which are designed by me as well as my crease-preventing shoe insert called The DeCreaseR. I have been featured on the News and in several publications as a both a reputable collector and a noted artist. Please do not worry about the legitimacy of the items I carry here on this or any of my other websites, they are always 100% authentic and I do not support fakes in any way. I do not consider my custom sneaker services to be a “business” since it is more of an art. When you commission me to do work, do not think of our relationship as a “business relationship” think of it more as a canvas to artist relationship. There is no standard practice or exact method of predicting when and how projects will turn out. An artist is never completely sure of what his work will look like when complete, he just knows when to stop, step away, look at his work, and say “finis”. Therefore put aside all expectations of how YOU want business to occur, ultimately this is my Kitchen and I operate my Kitchen under my rules. If you bug me too much or I get tired of your needling emails asking when your piece will be started or completed, I may just choose to terminate your order. The items that I do consider to be a business are my accessories: shirts, DeCreaseRs, etc. You can expect pretty strict standards of practice on all items I don’t have to create by hand. All the t-shirts I offer on this website have been either designed by me or are a collaborative effort with renown graphic artist “Mas”. The shirts offered on this website therefore are only available on GourmetKickz associated websites. They are all made to order and are subject to removal from this website at any time without advance notice. There are 2 types of shirts available: graphic tees and all over print tees. Both types take about 2 weeks to make since they are made to order. For all shirts keep in mind that images shown on this website are mockup images created in RGB color mode. Some colors and effects are not able to be printed with these exactly color settings and are therefore converted to CMYK which may differ slightly from what you perceive on your computer screen or device. With that said all efforts are made to use colors that are a “closest match” given the inks, materials and processes available to me. Some effects (glowing, branding, fading, splattering) will cause for some slight color adjustments to be made to the background color or pattern. When this is done, the background may not be an exact color match but will match as it will remain in the same specific color family. This color matching is sacrificed to some degree to achieve more important and striking artistic effects. Patterns and textures are specifically difficult to match so bear in mind that there will be some degree of variance with these types of designs. Cotton Tees used are 100% Cotton. We used either Gildan, Fruit of the Loom, or American Apparel tees. Multi-color graphics (greater than 3 colors) and photographic designs are produced using Direct To Garment technology. This process creates a graphic that feels very smooth and soft, softer than silk screen. The graphic is relatively vibrant, but the colors are not as vibrant as silkscreen since silkscreen inks are much thicker than DTG printer inks. You can expect a shirt that lasts a very long time. 1 to 3 color graphics typically use heat transfer materials that are very durable and feel similar to silkscreen inks. All sales are final unless the shirt contains an error and meets the Satisfaction Guarantee. Once a shirt is ordered, it is printed on demand, it cannot be cancelled after the order is placed. Satisfaction is guaranteed on all shirts, so if you have an issue please email chef@gourmetkickz.com as soon as the issue arises. Replacement shirts or refunds can only be issued with 14 days of your receipt. After 14 days items cannot be returned. We do not accept returns of worn garments. Returns of garments that “do not fit” are not accepted since a size chart is provided. The following are issues we will do our best to correct with a replacement shirt: stitching imperfections, rips and tears in the garment, extremely noticeable resolution issues in the printed graphic. If we shipped the wrong shirt we will immediately resend the correct shirt. Returns are handled on a case by case basis. In general there are no returns. Email chef@gourmetkickz.com stating the nature of the flaw / order error in the shirt you received. Send a picture of the issue to determine whether you need to send the shirt back. If you are asked to send the shirt back, please follow the return instructions in your email return approval, print the approval and include it in your package. The cotton shirts used by us fit true to size. Dye Sublimation is a process that uses printed transfers whereby the ink is “dyed” into the garment using a special press. The results are amazing all over printed designs which break the boundaries of older and more limiting garment printing techniques. Sublimation is traditionally done with a white polyester t-shirt (100% polyester allows for better colors than a cotton/poly blend) and results in a softer, higher-quality print, particularly for photographic designs. Satisfaction is guaranteed on all shirts, so if you have an issue please email chef@gourmetkickz.com as soon as the issue arises. Replacement shirts can only be issued if you email us about your issue within 7 days of receiving your shirt. After 7 days we will assume you received a flawless shirt. Exchanges of garments that “do not fit” are not accepted since a size chart is provided. 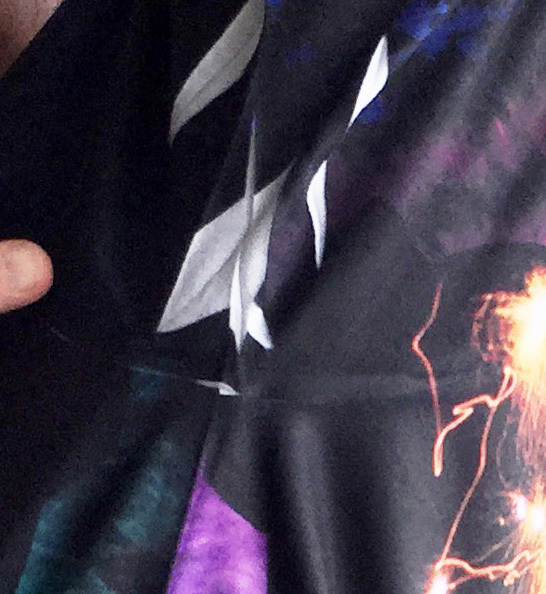 Furthermore, any emails about print/dye sublimation quality must include clear images of the issue. The following are issues we will do our best to correct with a replacement shirt: stitching imperfections, rips and tears in the garment, extremely noticeable gaps in graphic transfer that leave white space NOT near seam lines or armpits. If we shipped the wrong shirt we will immediately resend the correct shirt. Returns are handled on a case by case basis. In general there are no returns. The polyester shirts used by us for dye sublimation fit slighter larger than most other tees. For a snug or slim fit consider ordering 1 size smaller than normal. Exchanges of garments that “do not fit” are not accepted since a size chart is provided. I spent 2 years testing different types of polyester and finally settled on a polyester that “feels like cotton” and does not pill excessively even after dozens and dozens of washes. I worked with a t-shirt manufacturer to create a blank tee that lays “super flat” and allows maximum coverage of graphics with as few creases as possible in typical problem areas. My shirts are branded with the GourmetKickz logo and contain wash instructions to help you keep your shirt looking and feeling amazing. T-Shirts used are 100% Cotton Gildan, Fruit of the Loom, or American Apparel. Painted garments have a medium to heavy hand, this means you WILL be able to feel the paint on the surface of the garment. It will feel very similar to a silk-screened shirt. You do not have to worry about the painted areas bleeding or cracking / peeling. The paint is specialized fabric paint that is heat set into the fibers of the garment. Small variations may occur during creation making every item unique in its own small way. There may be a paint spec here or there or the design may be positioned every so slightly different from the shown image. For example, if you compared 2 of the same hand made garments, you may see some small differences, this is the nature of hand made items. The sweatshirt itself will be perfect. If there is a flaw in the garment itself, please let us know as we do our best to use only perfect garments, we inspect every garment to make sure it is free of manufacturer flaws. Sweatshirts used are 50% Polyester / 50% Cotton by Gildan or similar brands, depending on availability or color and sizes. This site also features a collection of Custom Nike Air Forces, custom foamposites, custom lebrons and other custom kicks that I have designed over the years. The goal ofGourmetKickz is to serve custom sneakers in a restaurant themed fashion that places great focus on creating something very unique for a client with high end taste. Many of my newest designs will launched for sale with just an illustration of the shoe. This is done purposely to book orders in advance since there is currently an average wait time of several months for any custom sneakers ordered on this site. Why such a long wait? Each sneaker takes nearly a whole day of non-stop work to create, sometimes several days or weeks are needed to cure coats of dye or allow adhesives to set. Additionally sometimes as an artist I need to step away from a piece, get inspired or get back in my “zone” and attack a piece with a fresh new attitude and state of mind. I do not “color by number” or treat pieces as standard coloring jobs. Since there is only 1 Chef, orders have piled up and I have established a pipeline. To expedite and manage orders, I try to group similar shoes to try and get them done in tandem. However, sometimes as an artist if I have a few size runs of a shoe to create, I do like to break them up so I don’t get bored of creating the same piece over and over again. So once again, there is no exact method to how I bring orders to life, I am sure some other sneaker customizers are more systematic so if you prefer a defined system hit them up and stay off this site. It is best to order custom sneakers while illustration images are up to avoid missing out. Many of my custom sneaker designs are subject to removal from this website at any time without notice. All of my custom sneakers are built to last, but sometimes I cannot guarantee that they will be scuff proof. Foamposites and hyperfuse based Nike products do not soak up paint, therefore when these items are painted, expect scuff marks to peel paint off. If you are looking for durability on foamposite or hyperfuse based products, pay specific attention to my custom designs that use my trademark “VT-Like fabric application” technique. This application is extremely durable and will resist scuffs and serious abrasions. To see more of my custom sneakers head on over to the gallery page or take a look at what I have cooked up recently on Instagram. The Kitchen runs on a perpetual backlog as this is a pipeline craft. This means an order booked today does not get started until all the orders booked before that one are completed. As you can imagine things back up easily especially when a bunch of orders are placed in a short period of time. I operate alone, I will not water down my craft by hiring help like some other “artists” or by over-using the airbrush like some other “artists”. Nor will I implement machines or factories like other “artists”. I do everything by hand in a manner that creates a durable, wearable, and long lasting masterpiece. If you want your kicks quick, there are certain listings that offer fast turnaround times. These sneakers are generally Roshes, Vans, or AF1’s. More complicated shoes like Foamposites and LeBrons will take much longer since there is a greater demand for them, they are harder to customize properly, and more orders have been placed for them. Therefore wait times for high demand shoes can be longer than 1 year! Once you place an order there are no refunds, cancellations or switching your order. If you persist to try and cancel or file an innacurate PayPal claim you will be sent a “grab bag” of shirts equal to or greater than the value of your original purchase. If you wish to inquire about a status update please wait at least until your estimated wait time has passed. Please check back frequently as this wait time is updated as often as possible to reflect the current Kitchen Workload. All the sneakers I offer are 100% authentic and sourced from a Nike authorized dealer such as Footlocker, Footaction, Champs, or Nike Factory Stores or smaller local chains. These sneakers are often marked up at a premium since they are usually limited editions, retros or specialty shoes whose inherent value increases after their day of release. These sneakers are often sold out at any of the retailers mentioned above. Consider this premium a convenience fee you pay for securing your pair from a reliable source and without the headaches of having to line up for hours or camp out. All sales of these products are final. This is my device designed to prevent and stop creasing in sneakers. It will also effectively reduce the appearance of already set in creases. Please follow the instructions included in The DeCreaseR packaging for best results and the most comfortable fit. The DeCreaseR is best used when placed for long periods of time in 1 pair of sneakers. 5 packs and 20 packs are available to accommodate your collection. Any issues with this product should be emailed. However after 9 years in production, this product remains unchanged and effective on nearly all types of sneakers. All sales of this product are final. This product ships immediately. Occasionally back-orders occur, you will be emailed to advise of any delays should they occur. I expect that any issues with orders or products will be handled via email or telephone. Any attempt to discredit GourmetKickz via social media will be met with immediate order cancellation, deduction of any costs incurred from designs in progress and base shoe procurement, banning from the website, and possible legal action if Libel can be proven. Chef is the artist behind the brand. A cancer survivor driven by his passion for life and creativity. His passion for sneakers gave him an outlet during his long recovery from bone cancer and was refocused toward a need to create. Chef is an artist by nature and true connoisseur of all things limited, collectible, rare, and fashionable. He has an impeccable sense of style and a great intuition for what will be hot and what won’t be. He is a taste-maker and trendsetter. Chef has written for SneakerNews and SoleCollector Magazine and been written about more times than he can recall. Being featured in Cey Adams book “The Definition of Hip-Hop” as well as Sole Collector’s 25th Anniversary AF1 issue are 2 of his most notable mentions. Chef is an award winning sneaker collector and has one of the most prominent collection of Nike AF1’s in the northeast. He is a veritable dictionary for AF1’s and a great resource for all questions to do with the care and maintenance of sneakers, leather, and shoes. Chef is also the inventor of the world’s first crease preventing shoe insert, he is a utility patent holder of the device known worldwide as The DeCreaseR. Chef has never dealt with fake shoes or B-grades and considers the dealing in shoes that are inauthentic to be a huge disgrace. Therefore Chef will never offer a shoe for sale that he has not authenticated. Some sneakers on this site may be available on pre-order but will not ship until the day of release. This is because Chef does not deal with “early release” sneakers unless they are sourced from the Nike “Seeding” Division or a Nike Sales Rep’s Sample allocation. Sneakers are more often than not sourced from actual Nike accounts.